On Saturday we had our daughter’s first birthday party. I can’t wait to show you all of the pictures. I found her dress at Burlington Coat Factory when she was only three months old and I knew that it would be perfect for her birthday. I based the whole theme of the party around the dress. 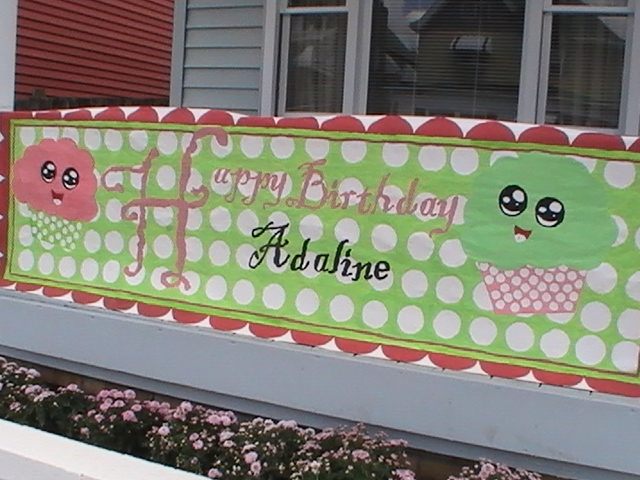 The theme was cupcakes and polka dots and the colors were shades of pink, lime green, and white. This was a family party consisting of around 20 adults. There were no other children at the party except for my two month old nephew, so I didn’t have to plan any games or entertainment. I hope to get the photos up soon. First I have to go through them all (there are over 500! ), then I need to edit some of them, and then I need to figure out how to add a photo to this new-fangled blog hickey-ma-doo. Hopefully I can get that all worked out before her second birthday 😉 ! Posted on August 12, 2010, in Birthdays, Coming soon..., Parties and tagged Birthday Traditions, first birthday, Parties. Bookmark the permalink. Leave a comment.